Dario "TLO" Wünsch (short for "TheLittleOne") is a German StarCraft II player. Currently, TLO is ranked #940 in highest overall earnings, and #26 in highest earnings for players from Germany. Out of the 152 tournaments where TLO received a cash prize, the largest was $8,000.00 from WCS 2015 Season 2 Premier on June 28, 2015. His 5th-8th place finish makes up 7.76% of his total prize money won. 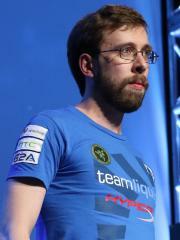 TLO overtook the $100,000 milestone on June 3, 2018, winning $2,750.00 and placing 9th-16th at DreamHack Austin 2018 (SC2 - WCS Circuit). Prize money from 148 tournaments got him to that point. In the last 90 days, TLO has been awarded $60.00 in prize money from a single tournament, none of which came in the last month.